A severe burn injury can leave the victim dealing with overwhelming medical expenses, permanent scarring, and missed wages. If someone else’s negligence caused your burn injuries, you have the right to seek financial compensation to cover lost wages, medical costs, and non-economic damages such as pain and suffering. Compensation can relieve the financial burden that often accompanies medical treatment and help you find peace of mind about the future and your finances. We take no fee for our services until we have successfully settled your case. 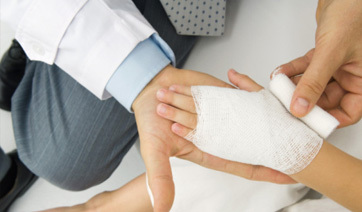 If you need an experienced burn injury lawyer in Chicago, you should take advantage of the skilled legal guidance that the team at Berenz Law Network offers each of our clients. We have secured millions of dollars in compensation for accident victims over the last decade, so you can rest assured that we know what it takes to win a difficult case. Why hire Berenz Law Network to handle your case? According to the American Burn Association, approximately 450,000 people receive treatment for serious burn injuries in the United States every year. Many of these injuries are treated at specialized burn treatment centers. Burn injuries and fires are responsible for over 3,400 deaths across the nation every year, and more than 40,000 people are hospitalized for severe burns. Approximately 30,000 of these victims are treated at hospital burn centers due to the severity of their injuries. These burns affect the outermost layer of skin (the epidermis). The affected skin will usually be red and very painful, but the burn should heal within a week. These burns affect the second layer of skin (the dermis). The affected skin will usually be moist and appear whitish in color. These burns heal within a few weeks. These burns extend down to the subcutaneous tissue. The affected skin may appear charred or leathery, and often require skin grafting procedures. These burns can extend all the way down to the muscle and bone, destroying all other layers of tissue and fat. They may also destroy nerves. Chicago burn injury lawyer Phil Berenz has dedicated his practice exclusively to personal injury cases. He has helped numerous clients to recover compensation in both settlements and jury verdicts. Unfortunately, insurance companies do not always have your interests at the forefront. They may try and get you to accept a settlement that is much less than what you deserve. It is important to have experienced and proven legal representation that is working only for your interests. We have successfully recovered millions in damages for our clients. We welcome the opportunity to meet with you and discuss your case. Attorney Berenz and his firm can provide you with insight and a full review of your case, and advise you of the best way to move forward to pursue compensation. Contact our office today to request a free, no-obligation evaluation of your cases. With Berenz Law Network on your side, you can have peace of mind knowing that your case is in capable hands. Ready to get started? Contact Chicago Burn Injury Attorney Phil Berenz today at 312-375-6524.